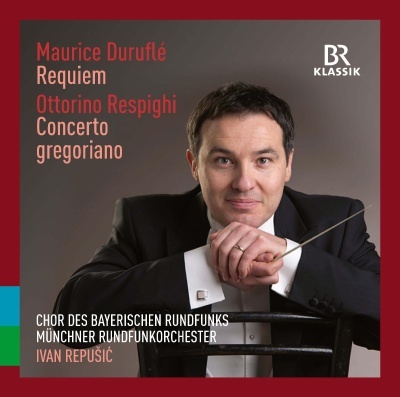 Ivan Repušić, the new chief conductor of the Munich Rundfunkorchester, devotes his first CD on BR-KLASSIK to works by the composers Maurice Duruflé and Ottorino Respighi, both of whom took a major interest in the melodies of Gregorian chant. The concert performance of these two works took place on 17 March 2017 in Munich’s Herz Jesu Church, with the Bavarian Radio Chorus. Maurice Duruflé’s work as a composer was plagued by doubts and scruples; for him, musical invention was “the fruit of persevering and laborious work”. This explains why his entire oeuvre of sacred organ and vocal music amounts to only 14 works with opus numbers, all of them strongly influenced by Gregorian chant, Late Romanticism and French Impressionism. His Requiem became especially well-known: its first performance in Paris in 1947 was one of the high points of his career. The work not only helped to establish Duruflé as a successful composer but also brought him fame far beyond the borders of France. The unique sound of Ottorino Respighi’s compositions results from a combination of the most diverse elements: French Impressionism à la Debussy, the artful orchestration of his teacher Rimsky-Korsakov, the tonal language of Richard Strauss, and even elements taken from folklore and neoclassicism. Long before Stravinsky, for example, Respighi made the music of earlier centuries the basis of his own oeuvre, and his preoccupation with Gregorian chant had a lasting effect – its impact on him was “like an addiction”. It undoubtedly exerted a huge influence on his art, and elements of it can be heard in almost all the works he composed after 1920. A further reason why these puristic melodies, in conjunction with the harmony of the ecclesiastical modes, fascinated him so much was that they represented the greatest possible contrast to the overheated, chromatically refined harmonies of the Verists and the post-Wagnerians. Becoming increasingly atonal was never an option for Respighi; it was in the archaic and austere character of Gregorian chant, and its ancient melodies, that he recognised the greatest innovative potential. A concert performance of the two works took place on March 17, 2017 in Munich’s Herz Jesu Church, and can now be heard on this CD.